It is rare to find a restaurant that lists themselves as family friendly and genuinely means it. 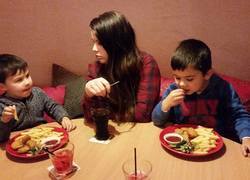 The Northlands Round House Tavern in Balcatta lives up to this promise with its child friendly atmosphere and enticing menu. Nestled in the northern suburbs, The Northlands Round House Tavern is the perfect mix of old school class and modern chic. A roomy dining area greets diners and wait staff are on hand to seat patrons quickly. Our table selection was left to our choice, naturally my children chose the only round booth in the entire establishment that had an I Dream Of Jeannie feel, however we paid our visit on a Tuesday night. Had we visited on a busy end of week night we may not have had that option. Meal choices were expansive and adaptable to individual tastes. Child meals were our greatest concern but this was quickly allayed when we discovered some tried and true dishes that are always a winner with the little ones. Chicken nuggets and chips were happily ordered and scoffed down. Each child’s meal had the option of Apple Juice or a ‘Fire Engine’ as the accompanying drink. Naturally the lure of the Fire Engine was too much and they opted for this. I did sneak a sip to taste but I was still none the wiser as to what it contained. The dining adults chose the traditional pub meal of Surf N Turf, The Seafood Platter and an original Parmi. Meals were brought to the table quickly and to our delight in order of importance. My little ones were happily eating by the time the adult dishes were served. As the final plate was finished the wait staff were quick to clear and offer to bring out the desserts. An ice cream cone was presented to each child as an addition to their kids meals. Adult desserts were ordered separately and delivered quickly. The dessert menu certainly wasn’t as expansive as the mains menu but too many sweet options and you could be there all night trying to make a decision. Hot apple pie with cream and ice cream, banoffee pie and, a chocolate sundae were the winners and not regretted for one minute. The highlight of the night, my children happily talked, laughed and occasionally squealed with delight as they ate and not an eyebrow was raised in their direction. The Northlands Round House Tavern had lived up to their reputation. For more reviews of kid friendly restaurants and cafes click here.